Is Consulting Staff an Expense or an Investment? When you hire staff—be they full time employees, subcontractors or temporary partners—to work on your consulting projects, are they a cost or an investment? Your answer to this question affects many aspects of your consulting firm, including its growth trajectory. 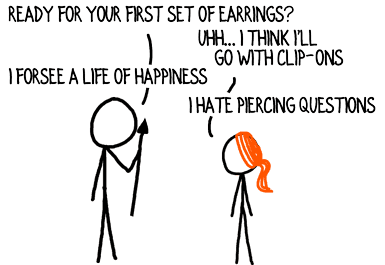 A handful of piercing questions reveal your approach to life and business, and explain your character, success, and happiness. For instance, do you look at the world through a lens of abundance or of scarcity? Are your yardsticks of achievement internal or external? Do you see pancakes as a fattening, low-nutrition meal or a welcome opportunity to add chocolate chips to breakfast? Add to this list the question of whether you regard staff as a cost or an investment. The business coach Dan Sullivan poses this distinction, and it carries particular relevance for consulting firm leaders like you and me. The seven topics below illustrate how your cost vs. investment mindset drives your consulting practice and your growth prospects. With a cost mindset, your business feels like commodity manufacturing; i.e., selling and producing an offering. With an investment mindset, you experience your business as an uplifting cycle of winning engagements and creating value. When you have a cost orientation, you allow your clients to look at you as an expense. You brag that you’re a less expensive alternative to achieve their outcome than, say, big-name consulting firms. With an investment orientation, you push clients to view your firm as an asset that enhances their performance. You tout your ability to deliver a better outcome than internal staff or any other firm. Your clients want to minimize their spend. They focus on costs and you talk about hours and rates. Your clients want to maximize their gain. They focus on value and you talk about upside possibility. You take on clients who assign their projects a fixed value, like commodities. 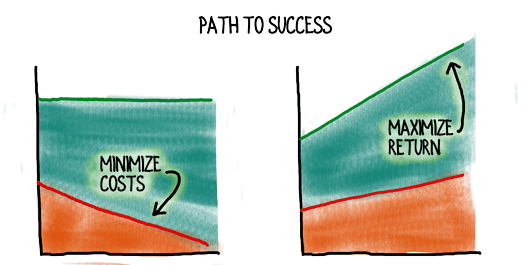 Hence, you help your clients envision how to minimize the cost to achieve their end. You only partner with clients who understand every project could result in various, successful outcomes, with vastly different value. Hence, you educate your clients on the paths to different levels of success. You price projects on time and materials, accept fees based on day rates, and focus on your cost of delivery. You price projects based on value created, structure contracts around your contribution to the outcome, and maximize your fees. You search for the lowest level employees/contractors who can do the work and you resist hiring. Labor is viewed as an expense to be minimized. You search for employees/contractors who can radically increase the value you deliver. Labor is an investment in your ability to wow clients, maximize value and, ultimately, enhance income. You measure gross margin (GM) and cost of goods sold (COGS). 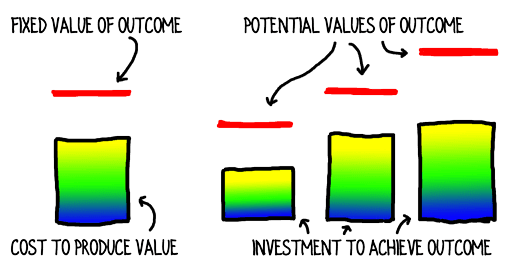 You track the return on your investment in value creation (RIVC). How does viewing consulting staff (including you) as an investment rather than a cost affect your approach to consulting? I’ve sent them a link to this post. There are many, valid positioning statements for a consulting firm, and “Just as good, but less expensive” is definitely one of them. The downside is it focuses everyone’s attention onto costs rather than results–clients look at costs, employees look at costs and the firm’s orientation is around minimizing cost rather than maximizing value. The upside is it talks directly to clients who perceive consultants as an expense that should be minimized. I’ll hazard a guess that the leaders of a firm who promote a low-cost positioning won’t be receptive to a message that encourages them to embrace investment thinking. It would be great to be proven wrong, though! Thanks for spreading the word, Will. Implication of cost vs investment on fees: Cost-based fee vs value created based fee. This simplifies the planning stage: no need to count hours while preparing a proposal, thus, reduces the cost of running business. When hours are not budgeted, all activities during delivery stage are aligned about creating value to client. I am willing to accept the risk of running projects without profit from time to time. The deficit is my investment into my learning. If profit is not there, I have to find a way to create more value. It sounds like you’ve significantly evolved your approach to consulting, Anatoli. Good on you! I love this concept: If there’s no profit in a project, it’s incumbent on me to learn how to create more value and more efficiency. Thanks for highlighting that idea. Hi David. We’re moving more and more to the right side of the page – in some cases a lot of re-education of clients is needed to understand value when they are used to time and materials. Fixed price for delivered value is the approach we prefer. As for staff, we’re too small to have any at this point, but the view is that talent needs to be nurtured and developed – as consultants all we have to sell is that talent, so we will sub-contract the ‘grunt work’ and develop our in-house talent to deliver the real value in terms of analysis and solution creation for clients. I liked the previous comment re: “its up to me to figure out how best to deliver the value” – we actually include a note in our proposals on why we don’t charge hourly rates, which clients have commented on as a useful piece as they valuate competing bids. Enjoying the postings, learning lots. Thanks! Congratulations on putting in the effort to elevate your firm and your clients, Jeff. Re pricing, fixed price is often a good structure; in many cases the ideal is a hybrid fixed/success-fee structure based on value. Including that note about pricing in your proposals is interesting. I’d wonder whether it’s borrowing trouble and potentially defending against a problem that may not exist. If clients have a question about your fee structure, they’ll typically ask. You’ve provided a good case study and some evidence in favor of including the fee language, though, and I appreciate you contributing your experience. We do both: add great value (my opinion) while keeping client costs lower then if they did the work themselves. We provide scientific and operations expertise to help clients with their projects. We can easily convince clients that we can do the work better then they can because clients do not have the expertise needed to do the work well. Clients can easily see the value we bring to their program. We can land clients because we have better negotiating power with external vendors then they do, and better understanding of what really needs to be done. For every new program, we ALWAYS find ways for client to save money on their outsourcing costs for their project by finding better/cheaper vendors, negotiating better on price then client, and cutting out work that is not really required. The end result is that we cut their outsourcing costs more than we charge in fees. When we are done, we provide all of the support that they need, achieve their goals, and reduce their overall costs. Compared to their do-it-yourself approach, clients get our services for “free”, and still have more money left over than if they did it themselves. The double formula of adding value AND reducing costs brings in clients every time. We are swamped right now. You’re going to market with a double whammy: higher value and lower costs! That’s always a powerhouse proposition, and you deserve to be swamped with client. One nuance: you can offer cost savings to your clients without your costs being a central part of the conversation. Many of the consulting firms I work with deliver cost savings to their clients as their primary benefit. Even though the focus of their work is cost savings, the fee structure we (strive to) use is based on the value the consultants produce rather than on the consulting hours or days. Offering to do work for “free” based on the amount of outsourcing savings is, to me, a more problematic long-term sale than offering to deliver upside value and outsourcing savings. With the latter positioning, I’m still well-placed to win work even after there are no more cost savings to find. Great example of a successful positioning, Peter. Thanks for sharing it.